Aurora Flight Sciences has secured a six-month, $2.9 million contract to continue the development of the D8 subsonic commercial aircraft as part of NASA’s aviation innovation efforts. 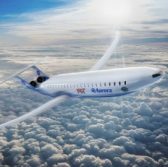 The contract aims to help establish requirements for the experimental aircraft or X-Plane program and kick-start the research phase to further develop the D8 commercial airliner, Aurora said Sept. 13. The goal is to mature D8 as a potential X-plane candidate under NASA’s Ultra Efficient Subsonic Transport Thrust that seeks aircraft with lower fuel consumption, noise and impact to air quality, the company added. D8 is a modification of the traditional tube-and-wing aircraft that incorporates the use of boundary layer ingestion, high bypass ratio engines and other composite materials. Aurora CEO John Langford noted the aircraft will also have a twin-aisle design. The aircraft was derived from Aurora’s development work on a transport-class aircraft in 2009 in collaboration with the Massachusetts Institute of Technology and Pratt and Whitney under NASA’s N+3 Program.